There's a whole lot of stuff going on in Aquaman, but it sadly doesn't add up to much. Anyone concerned about the oppressive seriousness of some previous DC live-action superhero movies will have nothing to worry about with James Wan's Aquaman, which is a deeply silly movie. It features a talking sea monster (voiced by Julie Andrews! ), flying blades formed out of wine, an octopus playing the drums, and sharks with frickin' laser beams. And yet it's also mostly boring, stretching its thin story over nearly two and a half hours and sending its hero on a long-winded quest just to put him right back in the same place. The bombastic dialogue sounds like something out of a 1980s action B-movie, and the design resembles a 1970s TV-movie idea of how superheroes should look, realized via CGI. It's a nonstop visual assault that seems designed to distract from the terrible writing and one-dimensional characterization. At least most of the stars seem to be having fun. Following his appearance in the ill-fated Justice League, Jason Momoa takes center stage as Arthur Curry, the son of an Atlantean queen and a human lighthouse keeper, who is extraordinarily powerful both above and below water. Arthur is content to take down pirates and pound beers at his local bar, but when Atlantean princess Mera (Amber Heard) comes calling, he's recruited into a battle for the fate of his ancestral home. Arthur's power-hungry half-brother Orm (Patrick Wilson) wants to wage war on the surface world, and the only way to stop him is for Arthur to challenge him for the throne of Atlantis. This involves a very long video game-style journey through multiple ancient undersea realms, all to retrieve a really important trident once wielded by the first ruler of Atlantis. It's mostly just a way to kill time between Arthur and Orm's first battle, in a gladiator-style arena, and the movie's final all-out melee. In the meantime, Arthur and Mera bond, Orm snarls and yells a lot, and secondary villain Black Manta (Yahya Abdul-Mateen II) makes enough trouble to pad out the running time. Momoa and Heard have strong chemistry, and they bring a sense of playfulness to their predictable banter. Wilson chews tons of virtual scenery as the megalomaniacal Orm, and Nicole Kidman does her best to bring a little gravitas as Arthur's patient, level-headed mother Atlanna. But it's hard to take any of them seriously in their ridiculous, garish costumes, gliding around an Atlantis that's a little too reminiscent of the goofy underwater city from Star Wars: Episode I — The Phantom Menace. Not that the movie is necessarily aiming to be taken seriously: Wan interrupts nearly every important speech or heartfelt conversation with an explosion or attack, which becomes a sort of running joke by the end of the movie. Best known for his pared-down horror movies (Saw, The Conjuring, Insidious), Wan has lately embraced blockbuster maximalism, first in his Fast and Furious entry and now in this over-the-top cacophony of a superhero movie, with battles featuring literally thousands of digitally generated combatants, all crowding the screen in an often incoherent jumble. Setting most of the action sequences underwater only makes the various participants harder to discern, although at least it sets Aquaman apart from every other superhero movie. 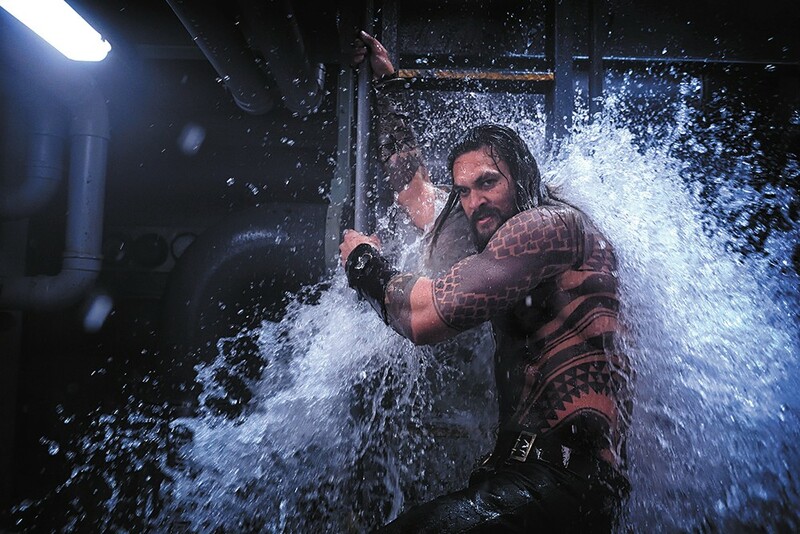 The original print version of this article was headlined "Waterlogged"
Aquaman and Aquaman 3D are not showing in any theaters in the area.